Michel was a Belgian man, who purchased barrels of whisky from several different distilleries in Scotland. He then traveled to Spain to find the very best Sherry butts from Andalusia. Then finally, he assembled the two and housed the Scottish whisky filled Sherry casks in his caves dug out from a mountainside in Burgundy, France. Sadly Michel Couvreur passed away in 2013 but his well-known whisky’s will live on. His apprentice Jean-Arnaud, who had trained under him for a decade, carries on his legacy of blending spirits and the flavor continues. We have for sample Michel Couvreur’s Overaged Malt Whisky, which is a single malt blend composed of whisky aged 12-27 years. The second offering is a Grain whisky, named Clearach, from malted barley matured in sherry completely. On to the tasting! Color: Clearach is of a lighter color than the Overaged, but both exhibit a dark walnut color, with the Overaged leaning towards a dark oak color. Nose: Clearach immediately explodes with a nose full of cereal, grains and nougat. Very light low-grade honey, as if it was pulled right out of the comb, raw. There’s a hint of white grape juice and a sour grassiness that comes out as well. A multilayered nose. The Overaged whisky is far more along the lines of what I love to drink when it comes to Scotch. Full of rich milk chocolate notes, caramel and toffee. Burnt sugars and sweet vanilla. I pick up the freshness of stone fruits like apricots and plums with a slight sourness that isn’t a bad thing. Palate: Beginning with the Clearach the palate is full blown grain, barley and cereal rich. Biscuits come to mind with bran and saw dust. A lot of oak but not overpowering oak. And although there is a sawdust-like component, it’s not an astringent wood, just a little wood sour. Nutmeg is a predominant spice in the Clearach with a vanilla undertone. The Overage is nice and sweet. Coating, thick and rich as it rolls into your mouth. There’s an initial tobacco entry, but not like someone smoking next to you in the train station, but more like walking through a field in South Carolina growing tobacco. A sweet almost herbal tobacco without the smoke…Oh wait, I spoke too soon. There is a whiff of smoke but very light and near the end as I breathe out after I swallow. The flavor is full and rich and creamy. Both are 43% abv and perfectly suited to be sipped neat. Both have a very sweet syrupy texture and feel sticky on the lips. Finish: The Clearach finishes lightly spiced, slightly floral with minuscule amounts of woody sweetness. Reminiscent of an Irish whisky to me. Good, but not Scotch. The Overaged on the other hand is a treasure. Although the finish is far too short, the ability to pour another glass more than makes up for it. 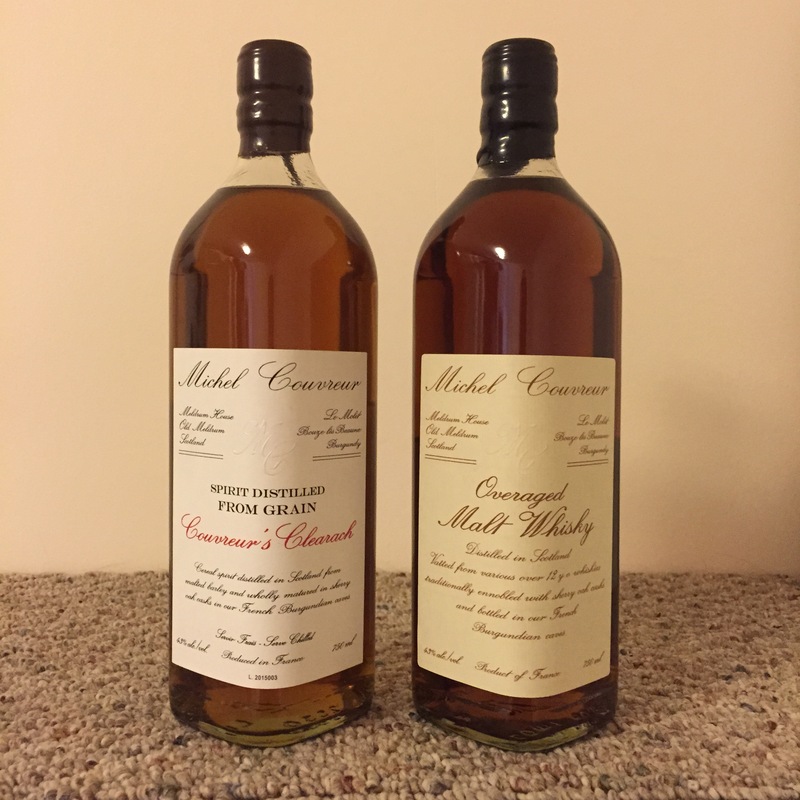 I purchased both of these bottles on sale for a low low price. The Overaged was $35 and the Clearach was $30. I spoke with the owner of the shop and he said that no one knew about “Michel Couvreur” so no one purchased them, hence the sale. I think the going rate for the Overaged is $75, well worth the price and could easily compete with, and beat, Glenfiddich 18, Glenlivet 15 and Dalmore 12. The Clearach on the other hand, I wouldn’t purchase again, not even for $30. Until next time.